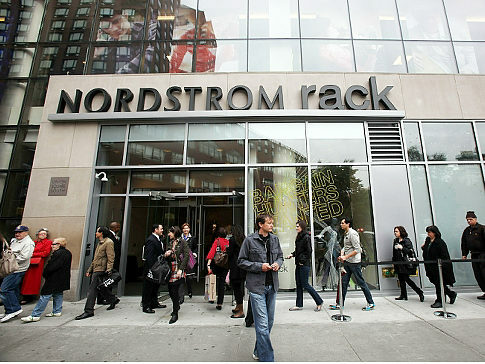 Nordstrom Rack - My first time inside a Nordstrom Rack was during this last visit to New York and it didn't disappoint. You'll find designer deals and clearance items from this high-end department store chain that are up to 70% off. We spotted a few of our favourites like Splendid, Free People and racks of designer denim and shoes. The layout is very much like Winners but with fancier merchandise. Uniqlo - I have blogged about American Apparel's Japanese cousin, Uniqlo before. It's the same fun basics that you can find at AA, but at a fraction of the price. 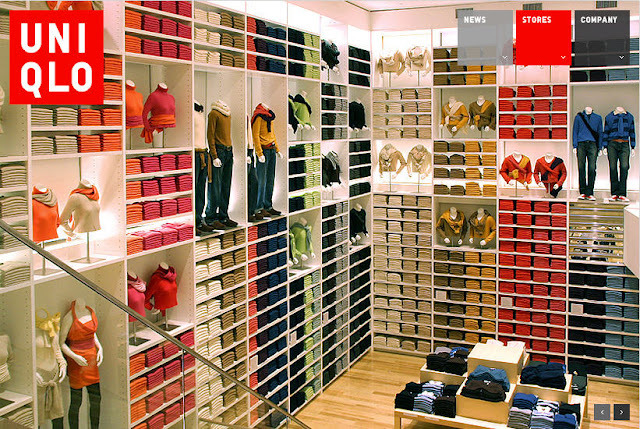 The Uniqlo store in New York City is a must-shop and one of few locations in North America. They will literally take one style of shirt and replicate it in 20 different colours, so goes the same for underwear, ties, tights and belts. Uniqlo also carries a wide range of jeans in a variety of styles and sizes. Read about our visit here. 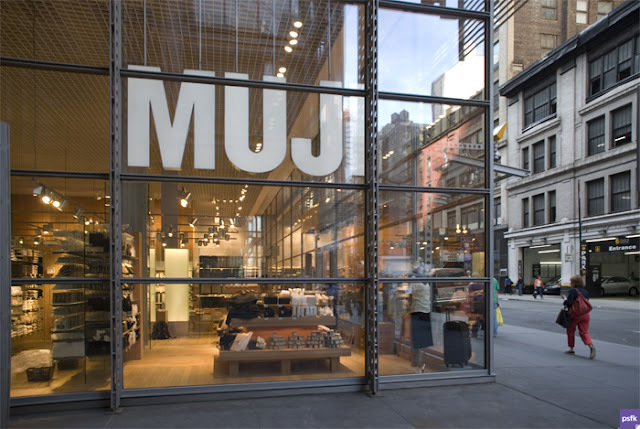 Muji - Right across the street from Uniqlo in SoHo is the Muji brand that sells simple Japanese housewares, clothing, stationery, furniture and beauty products. Prices are incredibly reasonable and everything is unique with a Japanese twist. 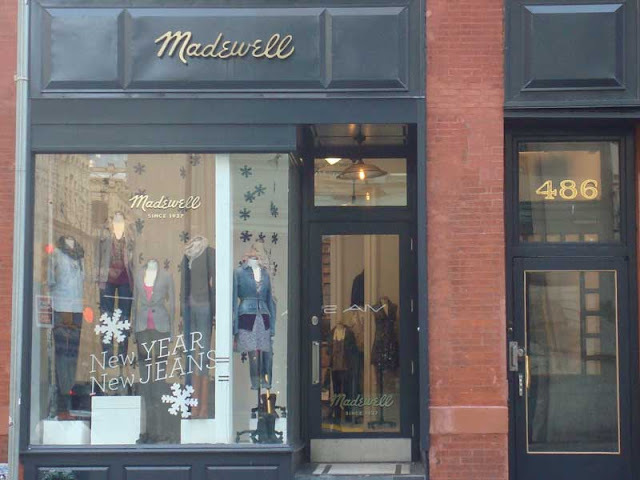 Madewell is like an Anthropologie owned by J. Crew. It's a little less preppy and a lot more hipster in terms of selection. IT Girl Alexa Chung recently collaborated on a line with Madewell which included vintage-inspired dresses, soft tees, a velvet dress and unique blouses. Make sure you check out their denim line, most fits are around $100. Topshop - You used to only be able to get your Topshop fix across the pond in London. Now this UK staple has an outpost in the Big Apple. It's sort of like a cross between Zara and H&M in terms of concept, pricing and inventory turnover. They add over 300 new styles every week and the prices are pretty decent, though not as cheap as H&M. The clothing is a bit hipper, less with the basics and more stylish and trendy. 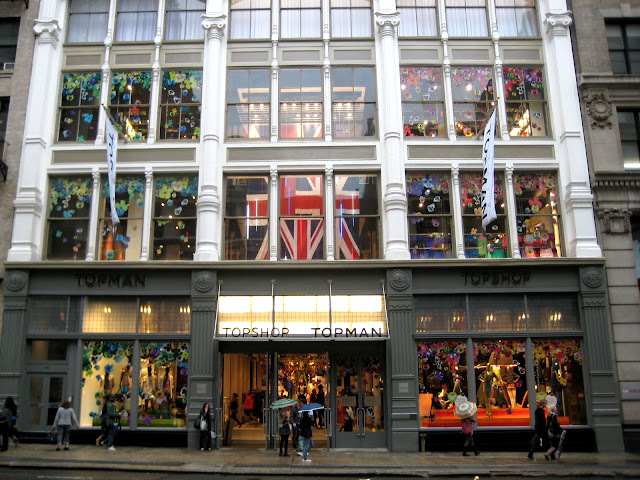 I know The Bay carries a nice selection of Topshop, but this megastore in NYC is still worth a look! 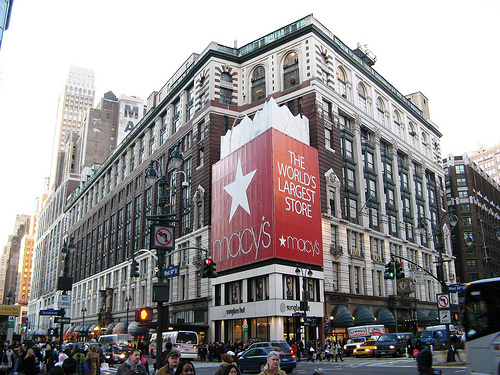 Macy's - The mecca of all department stores, The Macy's in New York City is the largest in the world. We are talking two full floors that span city blocks of contemporary women's wear for hip + urban girls. The Herald Square location is legendary and the sales/markdowns show that they are motivated to move inventory. I have scored many a good deal at this beloved Macy's. Give yourself two full hours to explore. Check out the line, American Rag which has a full section of loose and slouchy basics and fun prints for a steal. Marc Jacobs - The collection of different Marc Jacobs stores on Bleeker Street are my favourite. I always score something ridiculously wonderful from the Marc by Marc Jacobs line. We're talking $100 cashmere cardis, $15 paisley umbrellas, $20 glossy patent clutches or $20 rainboots. 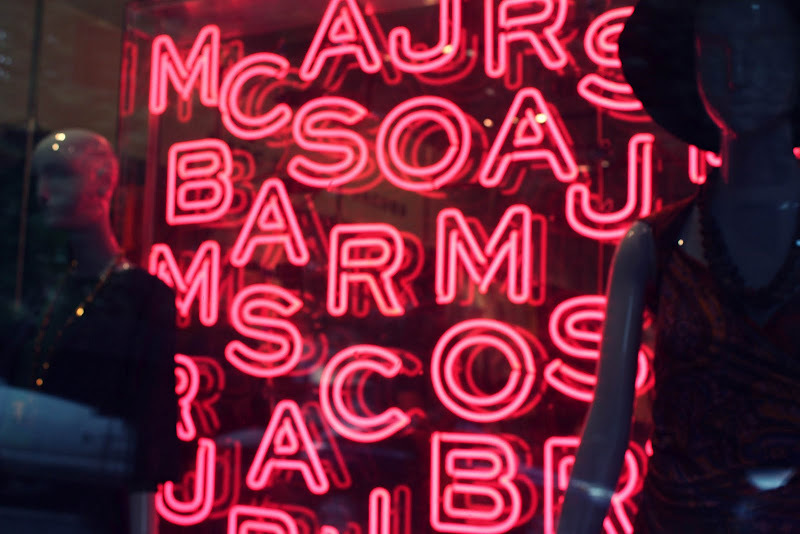 The deals are the best at the Marc By Marc Jacobs store. The Bleeker Street stores include bags, accessories, books and a mens store. Make sure you dash across the street after for a Magnolia cupcake. Century 21 - Similar in style to Nordstrom Rack, but much larger and broader in brands and departments. 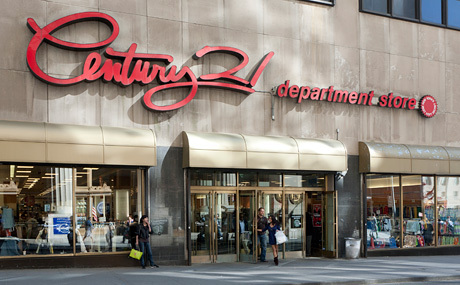 The Century 21 in the Financial District is THE location to hit up with five floors of bargains and an extensive shoe department. I scored a pair of Marc Jacobs sunglasses for $40, marked down from $90. The selection can be hit and miss, so clear your afternoon to sift through the racks. Ok we realize that this really is just the tip of the iceberg. So spill! What are your favourite stores to shop when you visit NYC? Going to NYC soon? Read more or our tips from our New York City Travel Series! I love Madewell! There are so many little shops in Manhattan that I love visiting. One of them is called Mint. I bought my first leather bag there! Never been to NYC, but will be there for BlogHer! Thanks for the post Lisa, cannot wait to visit some of these stores! Please tell me you'll be there!! I might be at a concert that weekend! Hoping to finalize my plans soon. Tammi - you're going to LOVE NYC! I'm heading back there in 2 weeks. Stay a couple days longer if you can after Blogher. LOFT by Ann Taylor-- that store could inspire me to move to NYC forever. The most amazing petites section you have ever seen-- it's their specialty. It makes Times Square even better!